Prices represent a trade-off between short-term and long-term strategies, profitability and market share as well as levels of cash flow. As a result, a company sets its prices in order to fulfil its different objectives such as profitability, cash flow or growth. A high price maximizes short-term profit but will result in a loss of market share, and hence have a negative impact on long-term profit. A low price maximizes long-term profit because it is generally more attractive to customers, which allows a firm to gain market share. The overall marketing strategy of a firm is a function of four main fields: costs, competition and market specificity, company objectives, target market and brand. Costs, competition and market specificity allow a firm to choose between different types of pricing strategies (for example cost-plus pricing or odd pricing). On the other hand, company objectives, target market and branding allow a company to set the actual level of price (for example, cost-plus pricing allows a firm to determine the level of mark-up). Prices also vary considerably according to a firm’s branding strategy as well as its target market. For example, for a firm selling fashion products, the price signal and the brand are more important than the actual product quality, and hence the demand elasticity is positive in this case. As a result, the pricing strategy of such a company will be to set the price as high as possible. The brand and the target market determine the price level. The brand by itself is already a signal of both the quality and the price level. For example, given its high-end branding, Apple does not sell low-cost phones, while Walmart will not does very expensive products. The target market also determines the price: students cannot afford very expensive products for example. Every brand is associated with a certain brand image and the pricing must respect this brand image. In fact, the price is more linked to the brand rather than to the actual quality of goods. Luxury brands avoid discounts or low prices because they damage the perceived value of their goods. The extreme version of this is a luxury watch such as a Rolex which is supposed to have lasting luxury value. This signifies that the prices associated with any brand need to be coherent with the overall brand image, meaning that all the individual products of a given brand also need to be priced in accordance with each other. In branding, price coherence also implies focusing on a specific target market. For instance, Walmart’s target market is represented by lower and middle class customers, while Apple’s target market is more upper class. From this perspective, the price can be seen as a method of separating the company’s target market from other potential customers. According to Veblen, the upper classes engages in what is referred to as “conspicuous consumption”: their consumption needs are in direct link to their desire to demonstrate their wealth, signifying that they often choose products based purely on their price. When a company’s target market consists of the upper class, the price needs to be very high in order to be distinctive. Moreover, the upper class has low price sensitivity and is therefore more willing to pay extra for everyday products, even where there is little improvement in the quality of any given product in comparison to its less expensive counterpart. For example, prices for garbage bags can vary anywhere between less than $1 and go up to $2. The $2 price tag is not at all significant for the upper-class target market and these customers are likely to choose the higher-priced product. 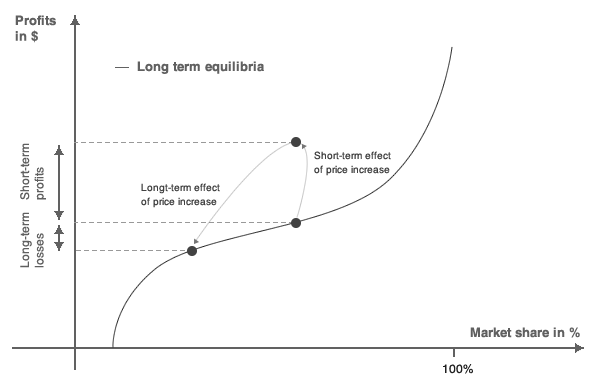 In the long term, pricing is also defined by the competition that exists on the market. Consequently, profit is positively correlated with the market share of any given company. 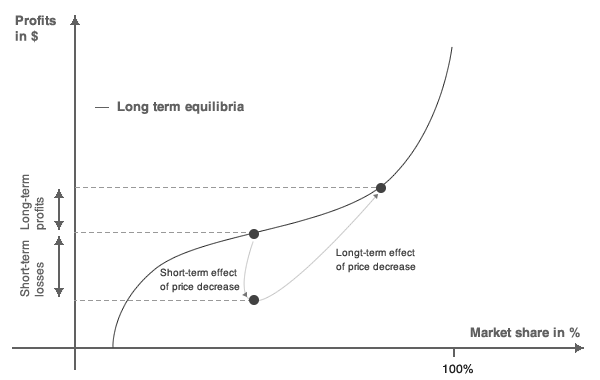 Price deviations are temporary and a firm always tends to return to its competitive price levels in the long-term while reaching a new equilibrium between market share and profit. 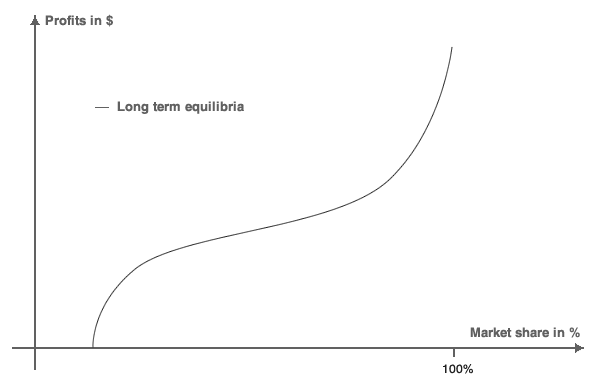 Below, we define a series of equilibrium between profit and market share. If the lifetime value is high, then a penetration pricing strategy aimed at increasing market share will be profitable. This involves accepting short-term losses in order to increase future profit. If the lifetime value is low, then a strategy which maximizes short-term profits by sacrificing long-term profits will be profitable. If a company needs to increase its cash flow, it can do so by increasing its price. In this case, the company’s market share is barely moving in the short term. Consequently, the immediate effect of the price raise results in higher margins and therefore higher profits. But due to this increase in price, the demand will slowly decrease as customers move on to buying from competitors. In the long term, the firm will reach a new equilibrium by losing some market share and gaining less profit. This illustrates that a firm can trade some of its market share for profit. This relies on the assumption that the adjustment in the demand is likely to take some time (as emphasized by Peter Diamond in 1971). This time can be used by a firm to generate immediate profits while accepting that demand will adapt and change in the long term. If a company wishes to adopt a growth strategy, it will be required to decrease its price. The immediate effect of price reductions results in lower margins and therefore lower profits. In this instance, a firm needs to accept sacrificing some profit and cash flow in order to gain new market share in the long run. This relies on the same assumption from Peter Diamond as outlined in the section above. In fact, a firm can expect demand to adapt to its profit in the long term. A growth strategy relies on the expectation that the short-term losses would be offset by the long-term profit. It also relies on the fact that a company has sufficient treasury in order to be able to resist to the short-term profit loss. For a company, the acquisition of new clients is an investment with long-term payback.